Investigators using a remote-controlled submarine found a sunken Greek cruise ship's data recorder and planned to bring it to the surface Friday, authorities said. ATHENS, Greece: Investigators using a remote-controlled submarine found a sunken Greek cruise ship's data recorder and planned to bring it to the surface Friday, authorities said. Two French tourists remain missing from the ship, which struck well-marked rocks April 5 and sank off the main port of the Greek holiday island of Santorini. Nearly 1,600 people were rescued, including hundreds of Americans and groups from Canada, Britain, Australia, France and Spain. 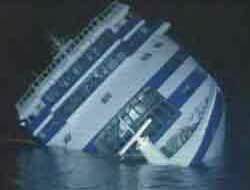 The ministry and the cruise line have blamed the sinking on human error. The ship's captain and five other crew members have been charged with negligence and are expected to testify next week in the ongoing probe. Costas Thoktaridis, the head diver at the site, told state-run NET television that a location transmitter helped locate the recorder. Ministry officials said they would try to pluck the recorder from its resting place 280 feet below the surface with one of two remote-controlled submarines. Most of the sunken hull, which has settled on a slope of a submerged volcanic crater, is more than 325 feet below the surface. "On the orders of the Coast Guard, only mechanical means will be used to recover the date recorder so that it is delivered to the authorities, and it will not be touched by human hand," a ministry statement said. NET said divers could be used if that effort fails. The submersibles, operated by the Hellenic Center for Marine Research, are also being used to try to locate the missing French passengers and to stop a leak that has sent more than 120 tons of fuel - about a quarter of the total amount - into the submerged crater.